As with most universities around Australia, CQUniversity is busy welcoming 1000’s of new students on to campus for Orientation Week activities – but unlike any other university, we have the added challenge of simultaneously conducting 16 orientation programs across 11 locations from Townsville in the north, to Melbourne in the south, as well as offering an on-line program for students unable to attend in person. And what a wonderful challenge it is to have. I guess that’s easy for me to say – I have the simple task of attending and chatting to students, but behind the scenes countless number of staff have been busy for weeks, if not months, ensuring everything runs smoothly for when our new students arrive. In addition to staff, our student mentors also do a fantastic job of showing our commencing students around campus and ensuring they settle in quickly to university life. 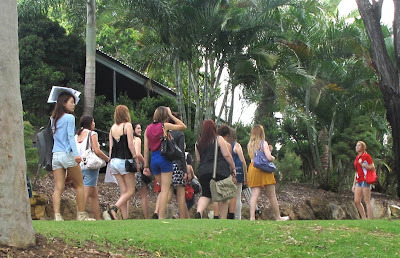 I've attached a photo of one of our student mentors in Rockhampton showing a group of students around our lovely campus. This week I go from welcoming new students, to celebrating with graduates at the Rockhampton campus graduation ceremony on Thursday. We have a truly inspiring group of graduates who will be receiving their degrees this week, something the commencing students can look forward to in the coming years. I love weeks like this, when I can see the excited looks on our students faces’ whether it's because they are starting on their journey of higher education, or finalising that chapter of their lives and about to embark on their next step. I think I speak on behalf of all the staff at CQUniversity when I say I am so proud to be a part of that. My sincerest best wishes to all our commencing students this week wherever you are.